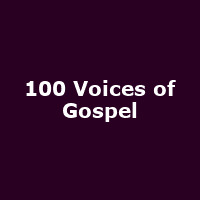 "Since its inception in 1998, The 100 Voices of Gospel has travelled across the world sharing its passion, faith and love for gospel with captivated and loyal audiences. The popularity of this excellent choir continues to grow and it has become one of the most famous in the world. Speaking about the UK dates the choir's producer Jean-Baptiste Guyon said: "It is a great honour for "The 100 Voices of Gospel" to sing in England."